easily recognized. 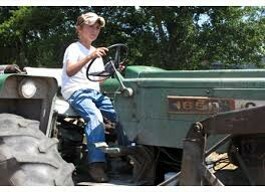 Noise that accompanies many farming tasks causes the more insidious onset of noise-induced hearing loss. Farming is ranked among the top occupations with the highest risk for hearing loss, mainly because of non-use of hearing protection devices. In the Mountain West region of the US, a 2013 US Department of Health and Human Services study suggests that noise-induced hearing loss (NIHL) is common among Spanish-speaking migrant agricultural workers due to their proximity to the noise produced by heavy farm equipment and livestock. While noise over-exposure is one of the largest hearing health hazards on the farm, the increased use of migrant workers as farmhands has greatly increased in the US. Over 3 million migrant and seasonal farm workers in the US are usually not educated on the hazardous effects of farm noise and thus, are exposed to a hazard that they assume is nonexistent. 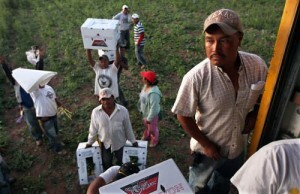 Who Are These Noise-Exposed Migrant Farm Workers? Farmworkers in the United States are relatively young, with an average age of 33. 79% of migrant and seasonal farmworkers were male and 21% were female. 81% of farmworkers surveyed spoke Spanish and only 18% spoke English. 72% completed their education in Mexico, 13% percent completed grade three or less, 13% had completed the 12th grade. 42% of farmworkers surveyed were migrants, having traveled at least 75 miles within the previous year to obtain a farm job. Farmworkers worked an average of 42 hours per week. Farmworkers surveyed by NCFH had an average of 12 years in U.S. farm experience. 41% of farmworkers had worked more than 10 years in U.S. farm jobs. has demonstrated that those who live and work on farms have had significantly higher rates of hearing loss than the general population. The noise from tractors, forage harvesters, silage blowers, chain saws, skid-steer loaders, grain dryers, squealing pigs and guns are some of the most typical sources of noise on the farm. Studies suggest that lengthy exposure to these high sound levels have resulted in noise-induced hearing loss to all types of farmworkers of all age groups, including teenagers. both conducted in 2014, demonstrate current trends in consumer patterns of digital and technology usage to obtain health information. The Pew research indicates that Hispanic/Latino populations are beginning to rely heavily on digital media over traditional print media for health information. Dr. Guiberson is testing the use of a digital graphic novella to educate these workers about noise-induced hearing loss. He says the agricultural workers rely heavily on digital media to obtain health information. Hearing International will continue to monitor this interesting study and update with the results as it progresses. Thank you for writing this fascinating article. 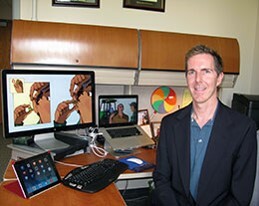 I am a public health professional who lives with progressive hearing loss. I’ve been in public health (in Maine, a rural state with migrant workers) for 25 years, but have never really thought about the noise damage/farm worker issue. The U Wyoming program is very interesting and I’m going to pass this along.